Receive a vegan subscription box that will make you love being vegan more and more every month. 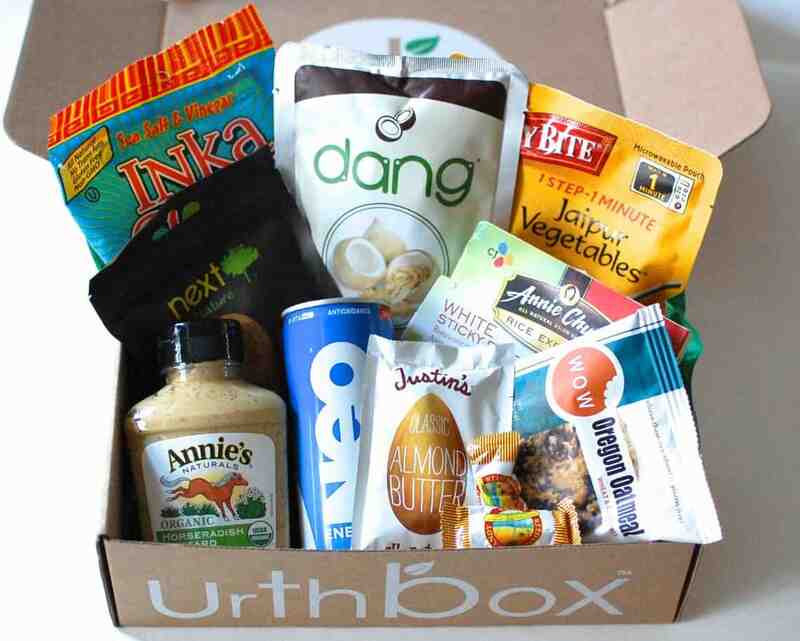 Here are the 14 best vegan subscription boxes that you must check out. What you get: The one thing that separates this Urthbox from the rest of the subscription boxes in the industry is the fact that you can purchase multiple sizes of the boxes based on how many organic vegan goodies you’ll like to receive. In some boxes, you can receive upwards of 49 different vegan products! Plus, all the products are full size, not samples. Coupon: Use this code Urbantastebud and get $10 off your vegan subscription box by clicking here! What you get: With the Purple Carrot you’ll get plant based, high protein, vegan recipes and ingredients delivered straight to your door. All you need to do to get started is select your plan and every week you’ll get pre-measured ingredients in a meal kit to help create spectacular vegan meals. This is one of the only few amazing meal kits that are vegan. Coupon / Buy Now: Use the code carrot30 to get $30 off HERE. What you get: From chips to cookies and sodas to teas, each month you’ll receive 7-10 vegan goodies delivered straight to your door with this Vegan Cuts snack box. Plus as an added bonus, these are all dairy free (hence the vegan part). Coupon: Click here to subscribe to this vegan box. Check out our full review and unboxing of Vegan Cuts HERE. What it costs: $5 a month plus the $5 goes towards your purchases as an account credit. What you get: You’ll get deliciously healthy, fully sized vegan, non-gmo snacks whenever you want. Coupon: CLICK HERE to join the NatureBox Club today. What you get: With graze, you tell them what snacks you love (over 100 to choose from), they hand pick a box for you of 8 tasty snacks, and then they’ll send it to your work or home. It’s that easy! Coupon: Click here to get started with your first box. What you get: Every month Petit Vour will send you 4 personalized (sometimes full-sized) beauty products for you to apply, blend, buff, lather, soak and spray. Coupon: Click here to subscribe to this box! What you get: Every other month you’ll received 5-7 full sized products and deluxe samples of nontoxic and cruelty free beauty products and skincare, healthy snacks, and wellness and eco style accessories. And best of all, customers have rated this box 4.6/5 stars which is fantastic! Coupon: Click here to subscribe to this box. What you get: Get 12-15 unique, 100% vegan friendly snacks in every box. Coupon: Use the code CRATEJOY to get 10% off for life HERE. What it costs: Starts at $29.95 a month. What you get: Get new essential oils and high quality vegan and cruelty free beauty and wellness products such as diffusers, skincare, books, snacks, home goods, activities, and more every month. What it costs: $24.95 a month. What you get: When you subscribe to the American Gluten Free Vegan Snack Box, you’ll receive 8-10 vegan snacks such as chips, granola, dried fruits, cookies, and other sweet and salty goodies. Plus as an added bonus, all the snacks are either Certified Gluten Free and/or made in a dedicated gluten free facility. What it costs: $24.95 – $65.95 a month. What you get: Every month, you’ll receive a box of 9, 18, or 27, Quantum energy squares delivered straight to your door. In every Quantum Square, you’ll get a delicious product that packs a punch of 100mg of caffeine (1 cup of coffee) as well as a blend of macronutrients like fats, proteins, and carbs. Best of all, all the squares are 100% vegan, gluten free, soy free, and dairy free, and they’re made with no artificial flavors or colors. What it costs: $8 per meal. What you get: Get healthy, gourmet, plant based meals delivered straight to your door. Best of all, every meal is made with organic ingredients and arrives at your door fully prepared! What you get: Every month you can choose 5 (out of 65+) premium, natural and effective personal care and home cleaning essentials. Coupon: Save up to 35% when you bundle and save by clicking here. What it costs: $34.95 a month. What you get: Every month, you’ll receive bath and body items, food, lifestyle items, activism products, and other vegan oriented products. Buy Now: Use the code URBAN10 to get 10% off here. What you get: Get 5-7 cruelty-free vegan trendsetting items such as superfoods, skincare, and eco-friendly accessories. Best of all, each box is valued at over $70! What’s inside: With this cool monthly jerky box, you’ll get 3 bags of vegan jerky featuring awesome, small batch flavor each month. Best of all, along with all the jerky being vegan, they are so non-gmo and gluten free! Thanks for reading and be sure to check out our complete listing of subscription boxes by clicking here.